PPLLC is a privately held company with 28 years of polymer processing expertise. PPLLC is headquartered in Northeast Ohio and offers custom thermoplastic compounding and processing services. 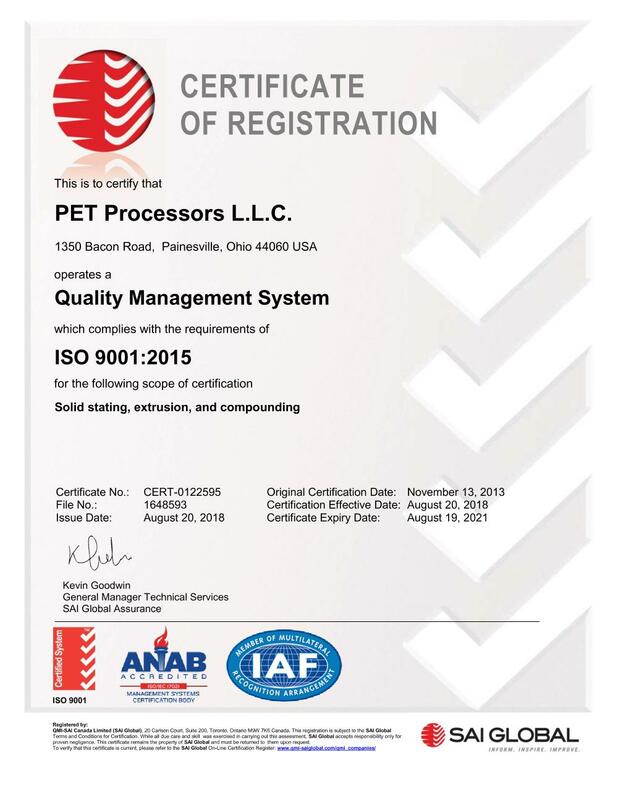 PPLLC maintains ISO 9001:2008 registration. PPLLC operates a facility constructed in 1937 to manufacture rayon cord for tires, hoses and belts by the Industrial Rayon Corporation. In the 1960's, the plant was expanded to include polyester batch vacuum solid state polymerization (SSP) and polyester tire yarn. Once the largest local employer, the plant was closed when acquired in 1981 by Louisiana Chemical, which began liquidating the remaining manufacturing equipment. Amongst the equipment were a number of rotary vacuum dryers (RVD) used to batch solid state PET (Polyethylene Terephthalate) plastic pellets. These dryers were originally installed in 1967 through 1972. Solid stating is a process involving heat and vacuum lasting about a day which increases the molecular weight of the plastic. This makes plastic stronger and gives it better properties for demanding applications like carbonated beverage bottles, specialty automotive plastic and telecommunications connectors. In 1984, a PET resin manufacturer approached Louisiana Chemical with a request to process excess PET. Other requests followed and in 1986, PET Processors (PPLLC) was created as a stand-alone business unit. In 1987, the remaining tire yarn extruders were converted	to pelletize PET post-consumer recycled materials. Other equipment and capacity has been added over time to support the changing needs of our customers. Customers in the 1980's needed long runs of similar grades of PET in and out of rail cars. In the early 1990's, the boom in clear beverage bottles began, with demand outstripping supply. PPLLC played a big part in debottlenecking SSP supply problems. Throughput was the objective, with annual output reaching one hundred million pounds per year. Improvements were made to increase total capacity, with dedicated silos for product types. By the middle 1990's, bottle PET supplies caught up to demand but specialty plastics and engineered polymers continued to grow, with ever higher standards for testing, clean outs, and process flexibility. PPLLC installed the first of three versatile twin screw extrusion lines in response to the growing compounded product needs of our customers. The late 1990's continued the trend towards engineered plastics and the highest quality processing. On any given day, as many as 15 different products can be processed. Capacity was increased again for high temperature products like LCP and HTN. The prime quality recycled market became a focus and PPLLC became one of the top ten producers servicing the recycled market in the USA. Our vacuum solid stating process has become part of FDA NOL letters issued to customers. Finally, in the 21st century, PPLLC aggressively expanded specialized services for the polymer industry, including installation of a melt phase pilot plant supporting resin development trial batches. The continued compounded product demand across all polymers led to the installation of two additional twin screw extruders. From the lab bench to market introduction, PPLLC offers an unsurpassed level of quality, confidentiality, and flexibility supporting the most demanding product applications.